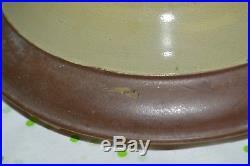 Ultra Rare Aladdin Venetian Art Glass. Model # 12 Burner w/Wick. 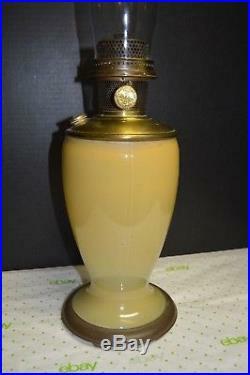 Lamp & Burner 14.5" H, 10.25" H Vase x 6.5 Wide, 6 Footed Base. 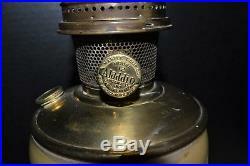 Ultra Rare & lovely find from a selective Aladdin Lamp Collector's treasure trove. 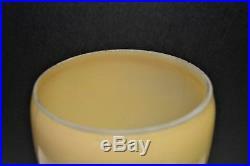 This is the rare Pale Yellow Venetian #1231 "U" Art Glass, Model #12 Burner Lamp (Vase Style). 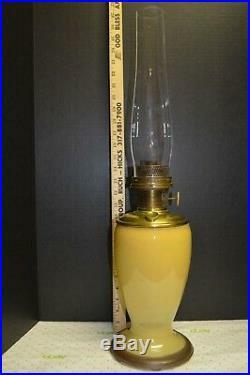 There is much more information available from the Aladdin Lamps info website on dates of production, models, etc. It is complete with a Lox On, unmarked chimney, Nice #12 Burner with wick & Flame Spreader. Ours is cleaner and nicer. 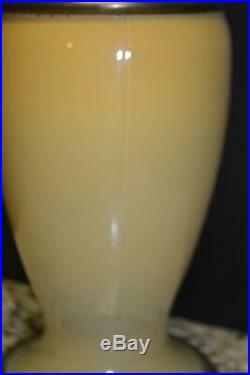 As you may know, the Pale Yellow is among the rarer of the Aladdin vase lamps. The coloring somehow gives it an Art Deco feel. We only dusted off the lamp. There is no fuel in lamp. 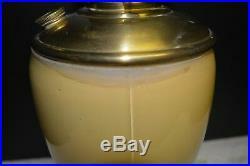 The lamp is in very good condition to excellent, see comments below. These lamps have a rich luster as they were painted inside, thus allowing the exterior glass to enhance color and protect the paint. The lower rim is painted on exterior which creates a bold contrast which is attractive as well. We photographed lamp from all sides. 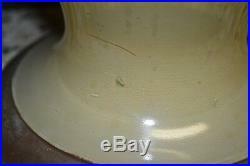 The vase area is in really nice shape, but shows some minor wear as described below. As usual with these lamps there are some small paint flake offs at upper rim from burner ins and outs we suppose (see pictures in gallery). A few can be seen from exterior, but they are not pronounced. We shot with and without flash as the color looks a little different in different lighting. 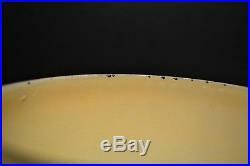 We noted a paint discoloring near top edge that appears to be from original production as are there are several color variations, glass lines, paint bubbles and other from production process. 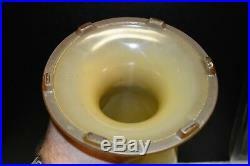 There is even a small chip near base at line (as pictured) that also appears to be from production as it has original paint over it. 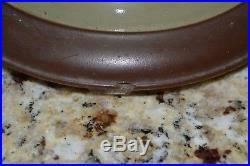 There are a few scuffs to lower rim (brown area) paint as pictured, but they are not significant in our opinion. We observed no cracks, chips or other that were significant, just the items we noted. There could be other tiny blemishes or production blips, but they would be minimal as we look over items thoroughly. Please look over all pictures and use zoom if needed. We do our best to describe in detail what we see and are painstaking in our packing. We have everything from rusty industrial to fine art by renowned US and foreign artists. We have Americana, Antique advertising, salesmen samples, Oil Paintings & sculptures by noted artists, Farm Primitives, Antique lighting fixtures and Aladdin lamps, militaria, sports memorabilia and much, much more. 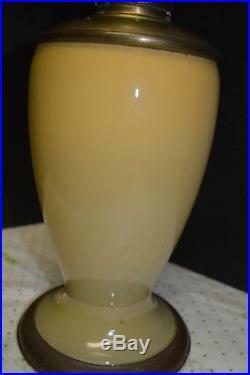 ALADDIN PALE YELLOW #1231 U, VENETIAN OIL LAMP ART GLASS VASE #12 Burner" is in sale since Saturday, January 26, 2019. This item is in the category "Collectibles\Lamps, Lighting\Lamps\ Non-Electric\Kerosene".delks" and is located in Indianapolis, Indiana.